So many rings... so many styles... how to choose?!? If your future husband is like most men, wearing jewelry is not anywhere near a part of his normal daily routine. When it comes time for selecting a wedding ring for your man, it can be hard to determine his style or choose something that he will feel comfortable wearing every day. 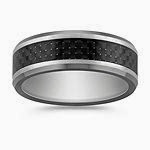 Shopping for men’s wedding rings can certainly be a daunting task; fortunately, here are some helpful tips that will make selecting the right wedding ring for your man considerably easier. 1. Consider His Profession One of the most important things you can do when selecting a wedding ring for your future husband is to consider his profession. A man’s ring will typically take much more of a beating than a woman’s and therefore it is important to consider what type of work your partner does on a daily basis. If he currently works in a blue-collar profession or likes to be the handyman around the house then an expensive ring with numerous diamonds is probably not the best fit for him. Make sure the ring is something that will be comfortable and durable for him to wear each day; if it’s not, he is likely to take it off and possibly lose it. 2. Choose a Reputable Jeweler While you may not think it really matters where you purchase your ring, a reputable jeweler, like Shaneco.com, will be able to get you a better deal on your ring. Shop around and ask family and friends about their jewelry experiences. There are factors to consider such as return policies and warranties so even if you find the same type of ring at different stores, the “cheaper” ring may not necessarily end up costing you less money once you truly compare services. perfect for couples on a budget! 3. Establish a Budget Once you begin shopping for men’s wedding rings, you will probably be surprised at the wide range of prices. Basic wedding rings made of titanium or stainless steel can cost as little as seventy dollars while rings including diamonds can cost over thousands of dollars. Before you begin shopping, establish a budget that both of you agree on and this will help narrow down your choices. Sticking to your budget will also allow you to spend money on other necessary wedding purchases. 4. Decide on Whether or Not to Match Some couples like to have their wedding rings match by choosing the same type of metal, stone or similar design feature. If this is something you and your partner desire, be sure to discuss this ahead of time as it may restrict your ring selection. Sometimes it is best just to choose one common feature such as metal type so that each person is able to choose something that they will be comfortable wearing every day. 5. Allow Him to Choose Even if you have an aversion to yellow gold, allow your future husband the privilege and opportunity of having an opinion on his wedding ring. Many women like to control all aspects of the wedding which usually doesn’t bother most men. However, because the wedding ring is something he is going to be wearing every day of his life, give him the opportunity to choose what type of ring he will feel most comfortable wearing.